Rather good EP from Radiohead. There There features of course the track of the same name, which is no less than one of the best moments from Hail the Thief with its catchy vocals and guitars and its increasgingly dark frightening ambiance. The B-Sides are also very original and different from the album's music as they are more electronic driven, as in Amnesiac and Kid A. Let us see them. Paperbag Writer opens with a disturbing violin to evolve with ethereal vocals, a punchy trip- hop beat and an efficient funky bass. This track has echoes from The Gloaming and could have well featured in a David Cronenberg's movie. Very dark and interesting. 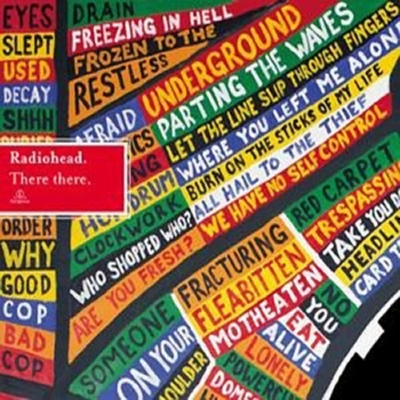 The second B- Side, Where Bluebirds Fly, may be one of Radiohead's most experimental piece, in the vein of Kid A. Upbeat electronic sparkles introduce a dark synthetizer theme. At this moment, one can ask himself if he is not listening to an Aphex Twin song. But the floating vocals of hom are immediately recognizable. A pretty ambient and mysterious track.